1) Make an appointment to bring the collection to my office, or in the case of a large collection an appointment for me to come to your home, office or bank to do the appraisal. I travel all over the West to do appraisals. 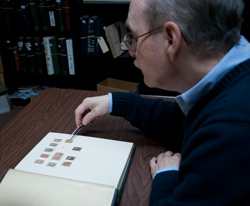 Unfortunately an accurate appraisal on a stamp or coin collection cannot be done online, or with just photos or lists. I must see the actual collection to do an accurate appraisal. 2) When the collection arrives I can do a quick overview to see approximately how long the appraisal will take. The volume and value of the collection make the difference in the time it takes for the appraisal. Generally a collection with 10 albums or less can be done in 2 hours or less. Even collections with hundreds of albums can be done in a relatively short period of time. The longest appraisal that I have done in over 30 years of appraising was the Gardner Shaw collection in Pullman Washington, contained in over 160 boxes, this collection took 2 ½ days to appraise and was valued at $118,000.00. Over 75% of the appraisals that I do take less than 2 hours. 3) When the appraisal is finished I prepare a written form that lists the value of the major components of the collection either by album or box. 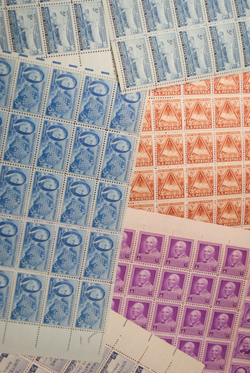 If there are individual stamps with significant value they will be identified separately and valued using the Scott Standard Stamp Catalog numbering system. 4) If you decide that you are interested in selling the collection I can give advice on the best ways to sell the collection and provide referrals to appropriate auction companies or dealers. What is the charge for an appraisal? I charge $100.00 per hour with a minimum of one hour. Travel time if I am required to go to the collection is billed at $25 per hour. How do I come up with the appraised value? According to the IRS instructions, an estate or fair market value appraisal should be "the price at which the property would change hands between a willing buyer and a willing seller neither being under any compulsion to buy or sell and both having reasonable knowledge of relevant facts… the price of the items should be that in which the item is most commonly sold to the public." 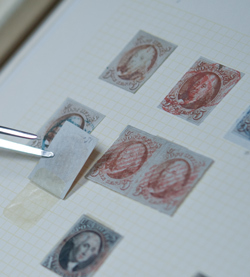 The best way to achieve this, especially for stamp collections is to use the value that the collection would be sold for in a well run public auction. Using auction valuations also makes it easy to back up my appraisal value if I am called into court to testify on my appraisal valuation.